What I enjoy most about TYO is how the orchestra goes about its creative process in rehearsal. Although we play some highly demanding repertoire, the support between the members and the continual expert guidance means that our finished product is always impressive and the experience always exhilarating. We generally accept membership applications throughout the year, so please do get in contact if you are interested in joining! TYO operates an informal entry policy. As a new applicant you will probably be invited to attend a rehearsal and then speak to the section coach at the end, who might ask you to play a short accompanied piece of your choosing. There might also be a sight-reading exercise. Periodically there may be re-auditions within sections - to reorganise seating, for example. As a guide, a grade 6/7 level is minimal. For wind players the standard will be slightly higher - effectively these positions are solo chairs. Clarinettists will be expected to possess a pair of instruments (Bb and A) and to bring them to all rehearsals. Horn and trumpet players should have some transpostition experience; trombonists should have a working knowledge of the tenor clef (and be prepared to become acquainted with the alto clef). Intermediate string players applying with grade 6 should bear in mind that youth orchestras necessarily operate with a mixed range of abilities: it’s not so vital that you are negotiating with total security absolutely every note in the difficult passages (the details will be covered by the more experienced instrumentalists who are), it’s more important that each individual is making a meaningful contribution to the weight of sound in the section. 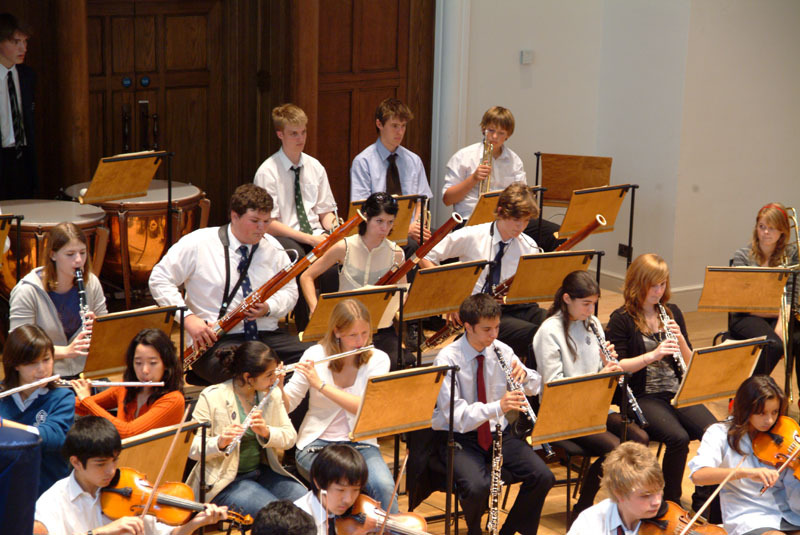 All the while you will be developing invaluable ensemble skills and learning from the musicians around you, as well as discovering the sheer thrill of playing in a good symphony orchestra. You will also find that nothing improves your playing so much as the challenge of tackling a rapid turnover of demanding programmes under the tutelage of expert coaches. In all, the experience is designed to be as enjoyable and educative as possible. If you would like to be considered for membership, or for any further information, please contact our administrator at thamesyouthmusic@gmail.com. TYO rehearses in Coombehurst House and the Visconti Studio at Kingston Univertity's Kingston Hill Campus, Kingston Hill, Kingston upon Thames, Surrey KT2 7LB. Rehearsals run from 6.15-8.45pm on Thursday evenings during term time. Click here for a map to the University music department. Subscriptions are kept deliberately low to be as inclusive as possible, with financial assistance available for those who require it.